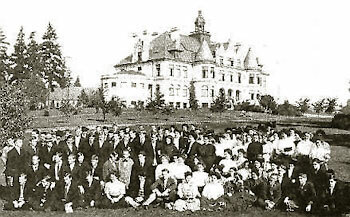 In the Spring of 1908, 1,600 students attended the University of Washington. Three of these students, Andrew Anderson, O.R. Karlström, and R.C. Stone, shared a Swedish heritage and a desire to see the Swedish language taught at the University. That desire led to joint academic and community action and the establishment of the Department of Scandinavian Languages and Literature at the University of Washington in the academic year 1909-10. The three students consulted Professor Carl E. Magnusson, professor of Electrical Engineering, and with his aid formulated plans to bring the matter before the Board of Regents. Magnusson encouraged the students to form a Scandinavian Club and, in May, 1908, a huge May festival was held sponsored by Andrew Chilberg, the Swedish Consul and President of the Scandinavian-American Bank in Seattle. The Chilberg family played central roles in Seattle's civic life. John Edward Chilberg, Andrew's nephew, served as Vice President of the Scandinavian-American Bank, built the Alaska Building, and was the President of the Alaska Yukon Pacific Exhibition in 1909, Seattle's first world's fair held on the grounds which today is the University of Washington campus. Two petitions were circulated, one signed by thirty-four students specifically requesting the teaching of the Scandinavian languages, and another containing hundreds of signatures from the community. The petitions called for the establishment of a Department of Scandinavian Languages and Literature. During the Autumn of 1908, students and interested community members lobbied the Washington State Legislature where, in March, 1909, a bill was enacted into law that ordered the establishment of the Department. The first professor of Scandinavian Languages and Literature, David Nyvall, was appointed by the Board of Regents in 1910. Nyvall came to the UW from North Park College in Chicago. A gala reception and banquet, to celebrate the establishment of the Department and to welcome Nyvall, was held at the Swedish Club on August 12, 1910. It was attended by more than 500 people, including members of the Board of Regents, members of the faculty, University President Thomas F. Kane, and members of the Scandinavian community of Seattle. In 1912, Nyvall resigned to return to Chicago. He was succeeded by Professor Edwin J. Vickner, recruited from Gustavus Adolphus College in Minnesota, who would remain at the University until his retirement in 1948. Under Vickner's energetic and imaginative leadership, the program developed regional and national recognition. 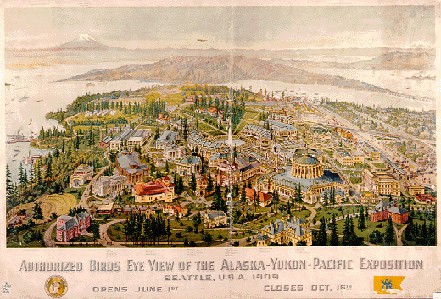 Vickner, initially, looked upon his move to Seattle as "an idealistic mission." In view of the heavy teaching load necessarily carried by a one-person department, selfless dedication was indeed required. While building and strengthening the curriculum, Vickner also presided over increased course offerings and an expanding student enrollment in the Department. In 1913, the curriculum included courses in the Swedish, Norwegian, and Danish languages, as well as their literatures. Vickner also taught Old Icelandic(Old Norse) and, in the same year, pioneered the teaching of Scandinavian literature in English translation. This development was originally opposed by the English Department, but it soon became standard practice for foreign language departments because of the increased enrollment potential it provided. Vickner's passion for teaching livened his classes and resulted in an expanding curriculum. Conservative and frugal in his personal habits, Vickner worked tirelessly to interest any student he encountered to register for a Scandinavian course. He would often set his assistants to work scouring the student directory for names that sounded remotely Scandinavian in hopes of recruiting one more student for the Department. In the Fall of 1934, a promising young graduate student, Sverre Arestad, was appointed a full-time teaching associate in the Department and, in 1938, he received his Ph.D. and joined the faculty. Arestad worked primarily with Norwegian languages and literature, but he also taught Danish. Highly respected as a mentor to graduate students, Arestad published several important articles on Norwegian literature, especially the writings of Henrik Ibsen. An immigrant himself, Arestad developed a special interest in, and published several articles on, the history of Scandinavian immigration to the Pacific Northwest. Partly, this interest grew out of Arestad's frequent travelling around the Pacific Northwest giving lectures to all kinds of groups, including Scandinavian ethnic organizations. For a time, the University of Washington gave faculty members extended leave to travel around the State to present lectures. Arestad was especially active in this regard during the Second World War. In 1943, Arestad was the prime mover behind the establishment of a Scandinavian Historical Research Committee. Although it survived only a few years, it inspired several articles and the collection and preservation of the records of Scandinavians in the Puget Sound Region. Upon retirement from the University in 1972, Arestad established the Sverre Arestad Scandinavian Research Fund to support the publication and dissemination of the history of Scandinavians in the Pacific Northwest. Upon Vickner's retirement in 1948, he was succeeded by Walter Johnson. The forty-three year old Johnson soon developed a reputation as the foremost scholar of Swedish writer August Strindberg and during his tenure as Chairman of the Department from 1966-1973, he presided over its expansion and rise to national and international prominence. Professor Johnson's firm belief in the viability of a degree in Scandinavian encouraged him in his plan for the expansion of the program. Beginning in 1948, the Department was authorized to grant the M.A. degree while Ph.D. students would minor in Scandinavian. At the center of scholarship in the field of Scandinavian studies, Johnson edited its scholarly journal, Scandinavian Studies for over two decades. The expansive years of the 1960s witnessed significant growth in the Department as well. Johnson and Arestad brought several visiting professors to the campus, convincing some to stay for extended periods of time. Among these was Karl-Ivar Hildeman of the University of Stockholm, who taught Scandinavian literature, especially balladry, and Scandinavian history, which he introduced with the approval of the Department of History. Also staying at the University for a several years was Ulf Beijbom, a renowned historian of Swedish emigration and former Director of the Swedish Emigrant Museum in Vaxjö, Sweden. The Department began offering the highest academic degree awarded, the Ph.D. in Scandinavian Languages and Literature, in 1967. For years, students in other Departments had included Scandinavian literature as a part of their doctoral studies, but degrees were granted through Comparative Literature or English or German. After 1967, this changed. The Department's first "home-grown" Ph.D. was Kjetil Flatin who would later join the faculty. Also, in 1967, the Department expanded its faculty with the hiring of Henning Sehmsdorf to teach Norwegian literature, Romanticism, and Mythology. He later served as Department Chair from 1978 to 1981. Enrollment figures indicate a remarkable growth during the decade of the 1960s as the number of students attending classes offered by the Department hit 2,357 during the 1968-69 academic year. A second tenure-track position in Norwegian brought Henning Sehmsdorf to the Department in 1968 after he received his Ph.D. from the University of Chicago. In addition to teaching Norwegian language and literature, Sehmsdorf developed the department's first folklore program. His research focused on both Norwegain literature and Scandinavian folklore. Following his early retirement from the University, Sehmsdorf established a new career with the S & S Homestead Farm and the S & S Center for Sustainable Agriculture on Lopez Island, Washington. As the Department celebrated its 60th anniversary, it still lacked a strong Danish component, however. In 1971, the Danish-American community and the Danish government chose the University of Washington as the site for the first Danish Chair in the United States. By agreement with the University, a faculty position in Danish was to be funded for five years, after which time the University would agree to assume the funding in its regular budget. Dr. Niels Kofoed of Copenhagen was invited to fill the position. Primarily, for family reasons, Kofoed returned to Denmark after only one year. In his place, the Department hired Dr. Inga Wiehl, a native Dane and former graduate TA in the Department, who had earned her Ph.D. in Comparative Literature. Because Wiehl was unable to accept the position permanently, a new search was instituted and, in January, 1974, Sven H. Rossel was appointed to the fill the position. Rossel taught in the Department until 1990 when he transferred to the Department of Comparative Literature. Rossel was Department Chair from 1981 to 1990. He was replaced in 1991 by Marianne Stecher, who currently holds the Danish faculty position. Stecher, who had done her Masters Degree work at the UW, earned her Ph.D. from UC-Berkeley where she developed an initial expertise on the writings of Thorkild Hansen. Rossel subsequently left the University to accept a position as Professor and Chair of Scandinavian Languages and Literature at the University of Vienna, Austria. As a mark of gratitude for his service to Danish, when he left, Rossel was honored with the establishment of a scholarship in his name, funded by a generous gift from Martin and Ruth Metzon. The decade of the 1970s brought the retirements of Walter Johnson and Sverre Arestad, but also several new faces, and a new profile. The Department's first Ph.D. recipient, Kjetil Flatin, returned to the University of Washington to replace Sverre Arestad, after having taught for two years at the University of Chicago. Joining Flatin was another Department Ph.D. recipient, Raymond Jarvi. In 1978, Flatin, subsequently, took a position with the University of Oslo in Norway, and Jarvi left the university to assume a position at North Park University in Chicago. To assume the chair of the Department, Birgitta Steene was recruited and hired as a Full Professor. With her international status as a scholar of Bergman and Strindberg, she assumed the position vacated by Johnson. Steene. who had received her Ph.D. in Comparative and Scandinavian Literature at the University of Washington in 1960, returned to Seattle after having taught in New Orleans, Calgary, and Philadelphia. Steene served as Department Chair until 1978. In addition to her Department duties, she was also appointed the first Director of the new Cinema Studies Program at the University of Washington. In 1982, Steene's undergraduate alma mater, Uppsala University in Sweden, bestowed upon her an honorary doctorate. The first specialist in the Department in Old Icelandic/Old Norse, Patricia Conroy, came to the University of Washington in 1974. Her hiring also added Faroese and Balladry to the areas of research and teaching in the Department. A second professor in Swedish further strengthened that area of the Department with the hiring of Lars Warme who, like Conroy, had done his doctoral work at the University of California, Berkeley. Immediately prior to coming to Seattle, Warme taught at the University of British Columbia. Terje Leiren and Jan Sjåvik. Jan Sjåvik assumed the tenure-track position in Norwegian following Flatin's return to Norway. His initial research specialization in Garborg studies expanded to take his research and teaching responsibilities into critical theory while he remained the principal faculty member in Norwegian literature studies until his retirement. The decade of the 1990s brought several personnel changes to the department with the retirements of Professors Steene, Warme and Sehmsdorf. The loss of three stalwart members of the faculty, however, opened the opportunity to change and develop with new hires. Among the new faculty joining the department in these years were Lotta Gavel Adams and Ia Dubois, both of whom specialized in Swedish literature and culture, along with Christine Ingebritsen, a political scientist with specialties in Norwegian politics, political economy and small states studies. The decade had opened with the expansion of the department's curriculum to include Finnish studies and the hire, in 1990, of Thomas DuBois as the UW's first professor of Finnish studies. DuBois played a major role, along with Daniel Waugh of the Henry Jackson School of International Studies, in the establishment of the Baltic Studies program before he chose to accept an offer from the University of Wisconsin, Madison, in 2000. The Finnish Studies program, however, was confirmed with the hire of Andrew Nestingen in 2001. Following thirty-six years of service to the UW, Jan Sjåvik retired in 2014, and the department began a search for a new faculty member for the Norwegian program. Olivia Gunn, Ph.D., University of California, Irvine, was hired on the tenure track as Assistant Professor in 2016. Professor Gunn earned her undergraduate degree from the University of Washington and has developed an expertise in several aspects of Norwegian and comparative literary studies. Professor Lotta Gavel Adams retired from full-time teaching in 2016 and the Department hired Amanda Doxtater as Assistant Professor of Swedish. Doxtater, who earned her MA degree at the University of Washington, joined the faculty after having taught five years at the University of Oregon. Terje Leiren, whose research focuses on nineteenth century Norwegian history, assumed the first tenure-track area studies position in the Department when he was hired in 1977 to teach courses in Scandinavian history. Since Karl-Ivar Hildeman's initial visiting appointments, several guest professors taught the history courses for the Department on temporary or visiting appointments. These included: Harald Rundblom, Kar-Ivar Hildeman, Ulf Beijbom, and Byron Nordstrom, among others. With Leiren, the Scandinavian historian held a tenure-track position in the Department. It marked a unique initiative and new direction for the Department which was now also expanding its interdisciplinary cooperation with other programs and departments across campus thereby sharing expertise and offering joint courses. In 2017, after forty years as a member of the Department faculty, Leiren retired from full-time teaching. A further broadening of the curriculum occurred in 1982 when a major in Scandinavian Area Studies was approved. In 1984, the first Scandinavian political scientist joined the Department with the hiring of Bengt Sundelius, who had earlier taught at Bradley University in Illinois. When Sundelius returned to Sweden to join the University of Stockholm in 1988, Leslie Eliason assumed the task of teaching Scandinavian politics. Her specialty in the Scandinavian Welfare State brought her to the attention of the Daniel Evans School of Public Affairs where she transferred in 1992. With the position again open, the Department hired Christine Ingebritsen, who earned her Ph.D at Cornell University. Ingebritsen's areas of specialization include International Relations, the role of Small States and Political Economy. Finnish studies had occasionally been seen as a kind of "stepchild" in the Department, but in 1990 that changed with the tenure-track hire of Thomas DuBois. A folklorist by training, but also a Fennicist, DuBois was asked to help to develop a program in Finnish studies. Within a few years, Finnish studies had reached a curriculum status equal to that of the other areas of study in the Department. In the year 2000, DuBois left the University of Washington. Following a year of uncertainty, the Department was authorized to rehire for the Finnish position. In 2001, Andrew Nestingen, was appointed with primary teaching responsibilities in the Finnish program. Nestingen, a graduate of the UW, specializes in Finnish culture and film, cinema studies and issues of transnationalism and globalization. In 1995, in cooperation with the Finnish Ministry of Education, CIMO, and UKAN, an agreement to support a Visiting Lecturer in Finnish was signed between the University of Washington and Finland. The first Finnish Lectureship was held by Sirkku Latomaa. Upon her return to Finland and the renewal of the agreement, Heljä Nurmela of the Sibelius Academy in Helsinki filled the position. She served with outstanding dedication to the teaching of Finnish in America for four years. When Nurmela returned to Finland, she was replaced by Virve Vainio who served for two years. The next Finnish Visiting Lecturer was Karoliina Kuisma, who served for five years as did Aija Elg. Since 2014, Ilmari Ivaska, who earned his Ph.D. in 2015 from the University of Turku, has held the Visiting Lectureship in Finnish. Building on the Finnish model, in 1997, the Department, largely through the efforts of Professor Marianne Stecher-Hansen, in cooperation with the Danish Ministry of Education, established a Visiting Lectureship in Danish. The first visiting lecturer was UW Ph.D. graduate Marianne Stølen who returned to her alma mater to teach Danish. In 2001, she was succeeded by Jakob Stougaard-Nielsen. Following three successful years as Visiting Lecturer of Danish, Stougaard-Nielsen returned to Europe and a position at the University of London. Stougaard-Nielsen returned to Denmark and was succeeded by Jan Krogh Nielsen. Following Jan Krogh Nielsen was Graduate Student, Kirstine Kastberg, who also earned her Ph.D. in the department in 2013. In Winter Quarter, 2011, Désirée Ohrbeck joined the Department as Visiting Lecturer in Danish. In 1993, Thomas DuBois and Guntis Šmidchens, along with Daniel Waugh, then Director of the Russian, East European, and Central Asian (REECAS) Center, developed a Baltic Summer Institute, a consortium with several other universities, to teach the languages of the Baltic countries (Estonia, Latvia, Lithuania). Building on the Summer Institute, the Baltic Studies Program at the University of Washington was formally begun in 1994. A financial foundation was laid with two major gifts to the program - one from the Latvian communities of the United States and a second from the Raisys/Liffick family of Mercer Island and Bellevue which focused on support for Lithuanian studies. These generous gifts were the beginning of the important fund-raising campaign to endow the Baltic Studies program and secure it in perpetuity at the University of Washington. The Department of Scandinavian Studies is extremely proud to serve as the institutional home for Baltic Studies at the UW. As such, Baltic studies has been incorporated into several Scandinavian area studies and literature courses and representatives of the Estonian, Latvian and Lithuanian communities also serving as active members of the Departmental Advisory Board. Recognizing the programmatic significance of Baltic studies across the curriculum, the University authorized the establishment of a full-time lectureship. Dr. Guntis Šmidchens was hired with the responsibility of developing and directing the program. Working with teaching assistants, Šmidchens directs the only university program in North America that teaches the languages and cultures of all three of the Baltic countries (Estonia, Latvia, Lithuania) in addition to a broad range of area studies and literature courses. The year 2006 proved to be an important year for the Baltic Studies program. In that year, the Kazickas Family Foundation in New York, led by Jurate Kazickas, President of the Foundation, established the Kazickas Family Endowed Professorship in Baltic Studies with a generous gift to the Baltic Studies program. Lithuanian-Americans, the Kazickas family supports educational and scientific projects in Lithuania and the United States. The University of Washington and the Baltic Studies program is honored to have been selected by the Foundation to receive this professorship. In 2013, Guntis Smidchens was appointed the first Kazickas Family Endowed Professor in Baltic Studies. The Bernice Kellogg Estate established the Bernice Kellogg Endowment to support Lithuanian studies, especially the translation and publication of Lithuanian literature into English. In 2008, the distinguished professor, Dr. Violeta Kelertas holder of the Endowed Chair in Lithuanian Studies at the University of Illinois, Chicago, was appointed the first Bernice Kellogg Fellow. In 2005, with the important support of the Latvian- American communities along with the government of Latvia, a Visiting Lectureship in Latvian Studies was established. Cooperative funding support come from the Government of Latvia, the Department of Scandinavian Studies, the UW College of Arts and Sciences, and the Ellison Center for Russian, East European and Central Asian Studies(REECAS). Iveta Grinberga, a graduate of the University of Latvia, was appointed as the first Visiting Lecturer in Latvian. She served for five years, from Fall 2004 through Spring 2009. The following Visiting Lecturer is Kristīne Motivāne.served from 2009 to 2012 when Iveta Grinberga returned to the department to fill the position. Baltic Studies - A Tenure Track Appointment. In 2005, a Department's request to convert the Senior Lecturer position to a full-time, tenure-track assistant professor position was approved. Following an international search, Dr. Guntis Šmidchens was hired to be the first Assistant Professor of Baltic Studies at the University of Washington, effective September, 2006. In 2012, Smidchens was promoted to Associate Professor with tenure. He was appointed the first Kazickas Family Endowed Professor in Baltic Studies in 2013. Smidchens heads the Baltic Studies program in the department. In 2006, an endowed chair in Norwegian Studies was established by a former student of Dr. Sverre Arestad and named in his honor. Arestad had taught at the UW for four decades, influencing his students with his humanity and generosity as much as he did with his intellect and academic demands. A scholar of Norwegian literature, Arestad also did ground-breaking research on the Norwegians in the Pacific Northwest fisheries. An exceptional scholar, he was intensely student-centered long before it became fashionable. The Sverre Arestad Endowed Chair in Norwegian Studies provides exceptional support for the faculty member holding the chair as well as for the students in Norwegian studies by providing support for scholarly publications and UW library enhancement. In addition, it allows the department to sponsor visits by scholars, performers, or artists from Norway to the UW where students can meet and interact with them. Professor Terje Leiren was appointed the first holder of the Sverre Arestad Endowed Chair in Norwegian Studies in 2007. In 2007, the Barbro Osher Pro Suecia Foundation, founded by Barbro and Bernard Osher, established the Barbro Osher Endowed Chair in Swedish Studies. The Barbro Osher Chair, initially established as the Osher Professorship, supports a faculty member's teaching and research in Swedish studies, especially in literature, language, and cultural studies. A native of Stockholm, Barbro Osher graduated from Stockholm University with a degree in languages and political science. She is the founder of the Swedish Women's Educational Association (SWEA) and was the President of "Positive Sweden/America," an organization with a mission to further the image of Sweden through educational activities in the United States. Osher is also the Honorary Consul General of Sweden in San Francisco and the owner and publisher of Vestkusten, a Swedish-American newspaper established in the United States in 1886. She serves as the Chair of both the Bernard Osher Foundation and the Barbro Osher Pro Suecia Foundation. Professor Ann-Charlotte Gavel Adams was appointed the first holder of the Barbro Osher Endowed Chair of Swedish Studies in 2008. She served as the Osher Chair until her retirement from full-time teaching in 2016. In the academic year 2009-2010, the Department of Scandinavian Studies celebrated the centennial of its founding. To celebrate and honor its many graduates over the years, the Department established the Distinguished Alumni Lecturer with the mission of bringing back to campus distinguished graduates who have gone on to establish themselves in their respective fields. The Distinguished Alumni Lecturer is invited to give a public talk and to meet with students. Dr. Rochelle Wright (Ph.D., 1975), Professor Emerita at the University of Illinois-Champagne-Urbana where she specialized in Swedish literature and film. Through the years, faculty members of the Department have maintained a strong presence and active participation in the professional societies. The national professional organization for Scandinavian Studies in North America is SASS (Society for the Advancement of Scandinavian Study) founded in 1911. Walter Johnson served as the managing editor of the organization's scholarly journal, Scandinavian Studies, for more than twenty years. Both Johnson and Arestad were elected to the Society's Advisory Committee by the general membership. In 1987, Birgitta Steene was elected President of SASS and served from 1987-1989. Terje Leiren was also elected President of the Society and served from 1993-1995. Leiren had previously also served an Associate Editor of Scandinavian Studies and was appointed to be the Society's Parliamentarian in 1999. In addition to Arestad and Johnson, Lars Warme, Terje Leiren, Birgitta Steene, Leslie Eliason, Lotta Gavel Adams, Christine Ingebritsen. and Andrew Nestingen have been elected to serve on the SASS Advisory Committee of the Society. In 2003, Professor Ingebritsen was elected Vice President/President-Elect of the Society and served as its President from 2005-2007, continuing the tradition of national leadership among the Department faculty. Andrew Nestingen serves as the current Book Review Editor of Scandinavian Studies. The Department has hosted the annual meeting of the Society on several occasions, most recently in 1962, 1977, 1984, 1999. and 2010. The 2010 annual meeting of SASS was held jointly with the national meeting of the Association for the Advancement of Baltic Studies. Faculty members are also active in a number of other discipline-specific professional organizations, including the International Studies Association, the Modern Language Association, the Society of Historians of Scandinavia, the American Political Science Association, the American Historical Association, the American Folklore Society, the Norwegian-American Historical Association, the Swedish-American Historical Association, the Danish Brotherhood, the International Association of Scandinavian Studies, among others. When the Department of Scandinavian Studies celebrated its 90th anniversary in the academic year 1999-2000, it welcomed the 21st Century with a vigor and enthusiasm that was stronger than ever before. In 1996, the name of the Department was officially changed to reflect its broader mandate and interdisciplinary focus by becoming the Department of Scandinavian Studies. Although the name has changed, the commitment to the three-fold mission of the University continues, - a commitment to excellence in research, teaching and service. Far from its origins as a dream of three students, yet consistent with the original intent of the Washington State Legislature, the Department of Scandinavian Studies today serves as an internationally recognized resource center for the research and teaching of Scandinavian and Baltic Studies and the less commonly taught languages of the Scandinavian/Nordic and Baltic regions. We believe in our commitment to provide the best possible education to our students while also informing the scholarly and the lay communities about Scandinavia and the Baltic countries, their languages and literatures, as well as their diverse and remarkable cultures, past and present. Took place, we believe, in the old Denny Hall. Language and Literature in the "Scandinavian tongue"
Just imagine planting Ibsen and Strindberg in a Washingtonian's head! The GI-Bill brought students to campus like never before. And by new hope, for remember, there never was to be another global fight. a Danish program in the seventies was born. With time were included Finnish and Baltic Studies. With continued scholarly dedication be blessed. And the hope of a promising future for us all!